in the AMRAD Newsletter for March 1982. This article had only terrestrial packet networking in mind. 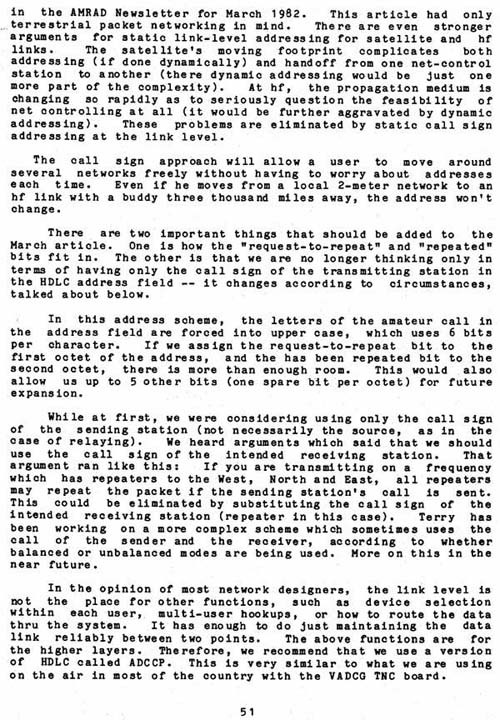 There are even stronger arguments for static link-level addressing for satellite and hf links. The satellite's moving footprint complicates both addressing (if done dynamically) and handoff from one net-control station to another (there dynamic addressing would be just one more part of the complexity). At hf, the propagation medium is changing so rapidly as to seriously question the feasibility of net controlling at all (it would be further aggravated by dynamic addressing). These problems are eliminated by static call sign addressing at the link level. The call sign approach will allow a user to move around several networks freely without having to worry about addresses each time. Even if he moves from a local 2-meter network to an hf link with a buddy three thousand miles away, the address won't change. There are two important things that should be added to the March article. One is how the "request-to-repeat" and "repeated" bits fit in. The other is that we are no longer thinking only in terms of having only the call sign of the transmitting station in the HDLC address field -- it changes according to circumstances, talked about below. In this address scheme, the letters of the amateur call in the address field are forced into upper casey which uses 6 bits per character. If we assign the request-to-repeat bit to the first octet of the address, and the has been repeated bit to the second octet, there is more than enough room. This would also allow us up to 5 other bits (one spare bit per octet) for future expansion. While at first, we were considering using only the call sign of the sending station (not necessarily the source, as in the case of relaying). We heard arguments which said that we should use the call sign of the intended receiving station. That argument ran like this: If you are transmitting on a frequency which has repeaters to the West, North and East, all repeaters may repeat the packet if the sending station's call is sent. This could be eliminated by substituting the call sign of the intended receiving station (repeater in this case). Terry has been working on a more complex scheme which sometimes uses the call of the sender and the receiver, according to whether balanced or unbalanced modes are being used. More on this in the near future. In the opinion of most network designers, the link level is not the place for other functions, such as device selection within each user, multi-user hookups, or how to route the data thru the system. It has enough to do just maintaining the data link reliably between two points. The above functions are for the higher layers. Therefore, we recommend that we use a version of HDLC called ADCCP. This is very similar to what we are using on the air in most of the country with the VADCG TNC board.